Our month-long journey to bring you the coolest gift ideas from the world of pop culture concludes with a comic book that I reviewed enthusiastically just a few weeks ago. This is our final pick in The 2018 PopCult gift Guide. 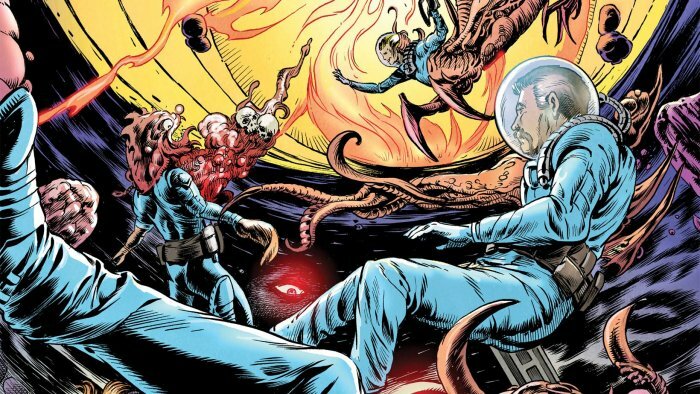 If the person on your holiday shopping list likes great horror comics, say, the kind that combine classic EC Comics with Rod Serling’s Night Gallery, then you can’t go wrong with Forbidden Gallery #3. As I said in my review, this third issue continues the wonderful combination of veteran talents with bright newcomers and creates a perfect comics experience for the Halloween season with five scary short stories , all hosted by Archimedes, the curator of the Forbidden Gallery. Forbidden Gallery #3 is a worthy successor to the excellent previous two issues . 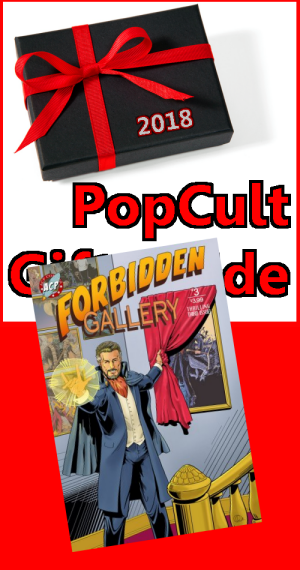 Now, you can get Forbidden Gallery #3, as well as the first two issues, plus ACP Comics T Shirts and posters for 25% off their regular price, and on top of that, 25% of all proceeds will be donated to Hero Initiative, the charity that helps comic book professionals who have come upon hard times. All you have to do is visit the ACP Comics website for details. You get the chance to load up on great comics and goodies, plus help out a worthwhile charity, all the while putting a smile on the face of your comic book-loving loved one. You can’t go wrong with that. With that, we wrap up The 2018 PopCult Gift Guide. This may be the last time that we devote an entire month to the Gift Guide, as it has been exhausting. We aren’t done yet, though. A special PopCulteer with the master list to this year’s guide is still coming later this afternoon, and we’ll be reminding you of some of our suggestions all next week, so stay tuned to PopCult. All of our regular blog features return tomorrow.